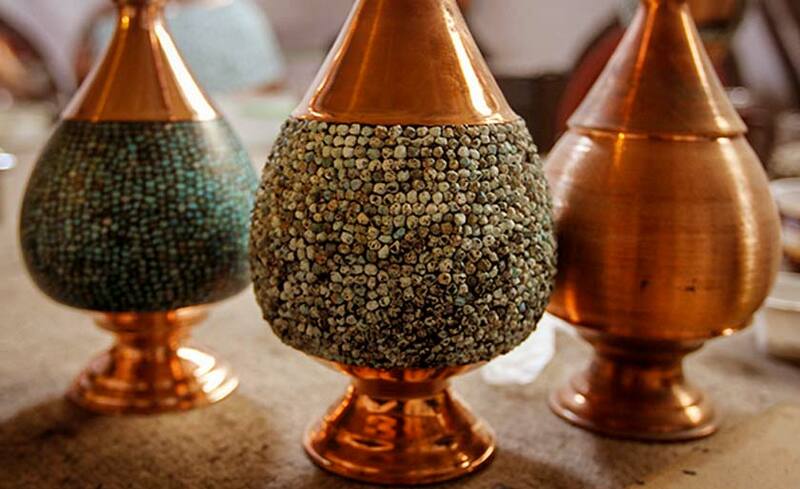 Turquoise fixing is an art which creates a layer of turquoise little-cut stones on the body of metal objects, making and preparing valuable decorative products. Turquoise fixing, as it is done today, is one of the contemporary arts of the recent century, but it has an old history just like the other available arts, because the technique of arraying small pebbles and colorful tiles has a long history not only in Iran but also all around the world, and it is the craftsman’s artistic talent that creates a new design by substitution of applied elements. 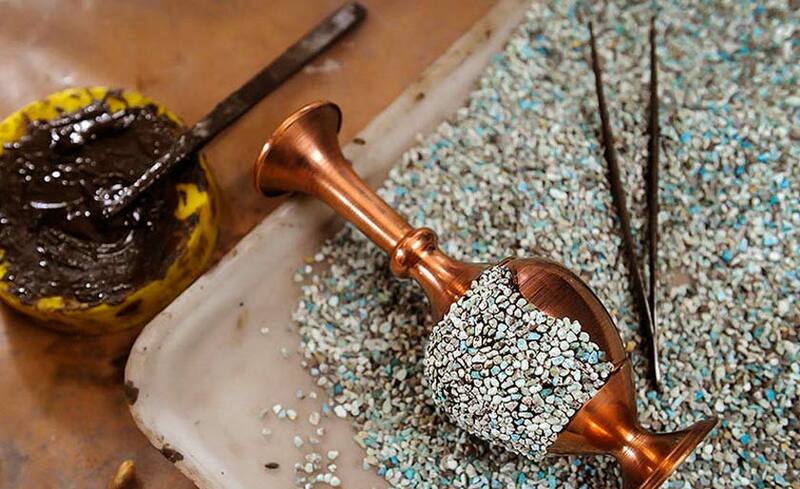 Turquoise fixing, generally speaking, is decorating the surface of metals such as gold and silver and manufacturing gold wares to the surface of copper, brass and etc. At the present time, it is done only in Isfahan. The underlying layer is made by the artist based on the design of the turquoise part, so that the surrounding of the part where turquoise is to be stuck is embossed for 2 or 3 mm. 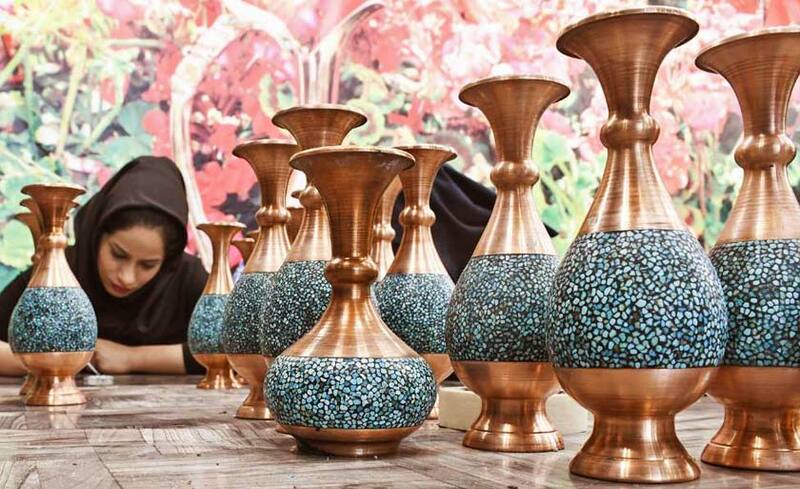 The small pebbles of turquoise stone are first purchased from the mines which are situated in Mashhad, Damghan and Neishabour, then classified as per their size, and their wastage is separated. From this stage the uniform beads of turquoise are arranged and stuck next to each other on the body of the object so that the least distance remains among them. For this purpose, the metal surface is heated up to 30 degrees and a special powder (lacquer) is sprayed on it and is heated again so that the melted lacquer covers the entire surface of the object. 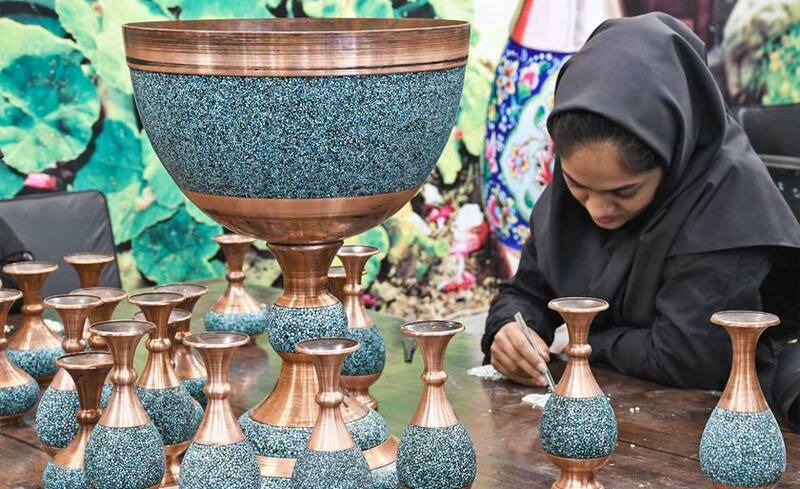 Now the body of the object is heated again and the turquoise stones are placed on the melted lacquer, then again a layer of lacquer is melted on the surface to cover the remaining pores. Finally, the finishing operation is done twice during which the extra and unwanted tiny turquoise stones are removed. 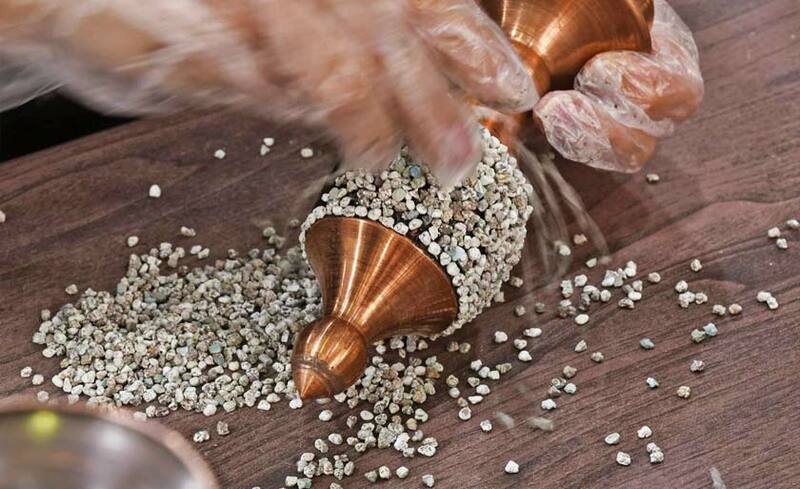 The turquoise studded part is polished by olive or sesame oil so that this part become as vivid and brilliant as the other parts. Technically, the uniformity of the turquoise stones is very important. The sky-blue color of the turquoise, and being pale with a lack of greenish hue makes the turquoise work of art more valuable.